In 2012, Cameron piloted his own single person submersible, DEEPSEA CHALLENGER, to the deepest point of the ocean, the Challenger Deep of the Mariana Trench. He is one of only three people who have been the deepest part of the ocean. Image: Mark Thiessen, National Geographic Creative. In 1968 fourteen-year-old James Cameron built his first submersible vessel called SEALAB 3, which he deployed in Chippawa Creek (Canada) with his pet mouse as the passenger. The mouse survived unscathed. Image: Courtesy James Cameron. It was watching all those great underwater explorers on TV in the 60s that got me excited about this alien world that was right here on earth that was as rich and exotic as anything I could imagine myself. Before James Cameron ever swam in the ocean, he was curious about it. In 1967, at the age of 14, he visited the Royal Ontario Museum where Dr. Joe MacInnis’s Sublimnos underwater habitat was on display in the forecourt. 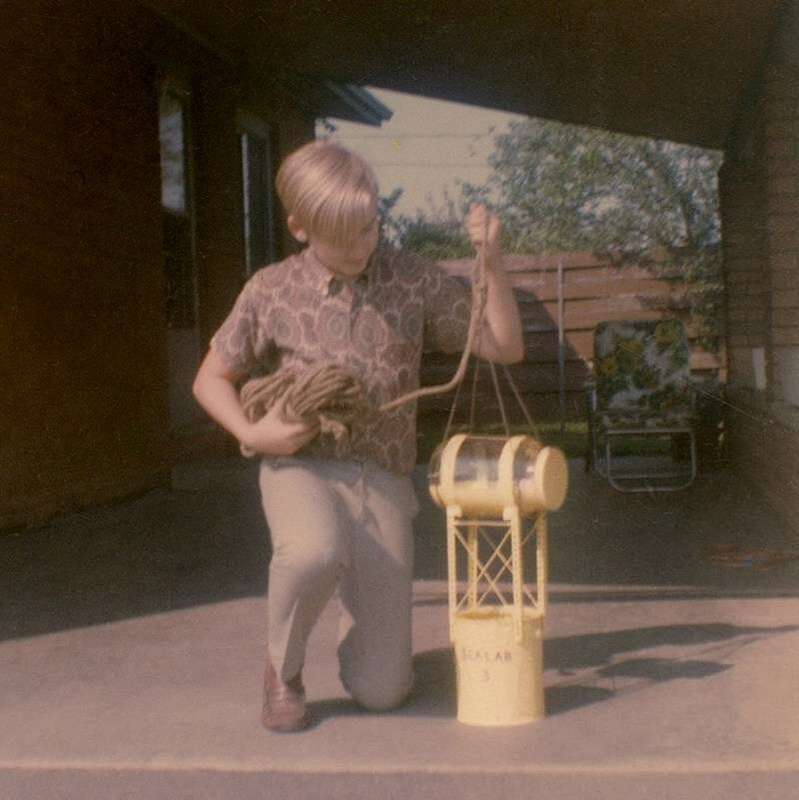 MacInnis was part of a movement that saw scientists, environmentalists and documentary makers bring the mysteries of the deep into 1960s living rooms via television. Underwater films by the likes of Jacques Cousteau, Ben Crop and Ron and Valerie Taylor showed us a world only accessible to divers with specialised equipment and training. Suddenly, the unknown was in front of us and seemingly within reach. Back home Cameron built a bathysphere (he called it Sealab 3) using an Erector Set, a jar and a tin can. He lowered into the nearby Chippawa Creek with his pet mouse aboard as the pilot, successfully completing a 20-minute dive at a depth of 15 feet (5 metres). Forty-four years later in 2012, Cameron would pilot his own single person submersible, DEEPSEA CHALLENGER, to the deepest point of the ocean, the Challenger Deep of the Mariana Trench. Cameron built a bathysphere (he called it Sealab 3) using an Erector Set, a jar and a tin can. 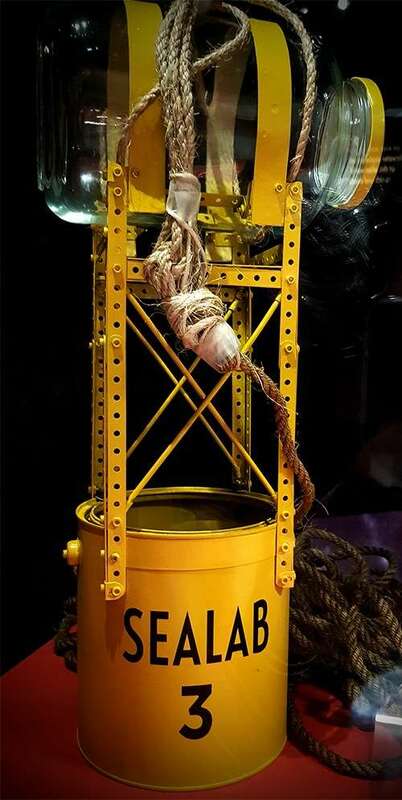 Sealab 3 reconstruction, on display as part of the James Cameron – Challenging the Deep exhibition. Image: Kate Pentecost/ANMM. I’m an explorer at heart, a filmmaker by trade. In many ways, our education system does a disservice to fertile minds. Rather than encourage the Renaissance woman (or man) in us, with each step, it narrows focus towards specialisation at the cost of cross-disciplinary skills and thought. Two years ahead of his class in high school Cameron was President of the Science Club and was the resident artist on the advertising committee of the school yearbook. When his family moved to California, seventeen-year-old Cameron studied astronomy and physics at college before realising his maths ability was exceeded by his desire to understand the cosmos. He transferred to an English major and eventually found a way to combine his dichotomous abilities as a consummate scriptwriter, designer and director of movies. Inspired by Robert Ballard’s discovery of the wreck of the RMS Titanic in 1985, Cameron began work on a project which allowed him to pursue his interest in maritime archaeology and create what would eventually be one of the top-grossing films of all time, Titanic. Inspired by Ron Ballard’s discovery of the wreck of the RMS Titanic in 1985, Cameron began work on a project which allowed him to pursue his interest in maritime archaeology and create what would eventually be one of the top-grossing films of all time, Titanic. Image: supplied Avatar Alliance Foundation. On 8 September 1995 Cameron took the first of 12 dives in Mir submersible vessels launched from Russian research vessel Akademik Mstislav Keldysh. 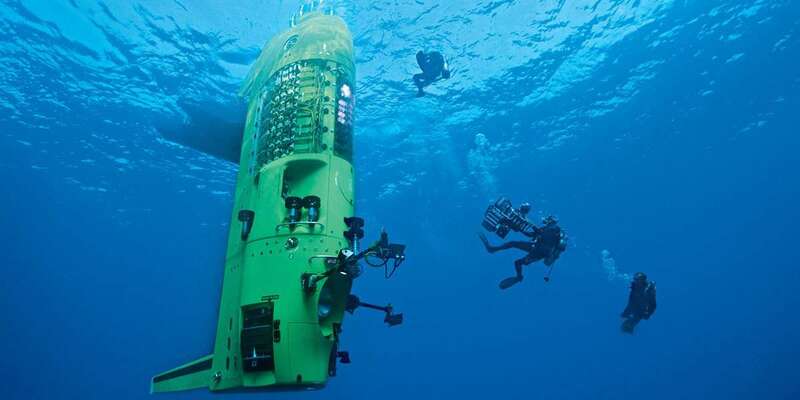 The Mirs were fitted with unique externally mounted 35-mm film cameras that could survive the immense water pressure at 3,800 metres, and with the custom-designed ROV Snoop Dog to explore the wreck close up. Footage from these dives and of Snoop Dog working was woven into the movie plot. With only 12 minutes of film in each camera, every shot was meticulously planned against a scale model of the wreck. James Cameron’s model making skills were essential to planning the dives on the wreck of RMS Titanic to get the key shots for the film. 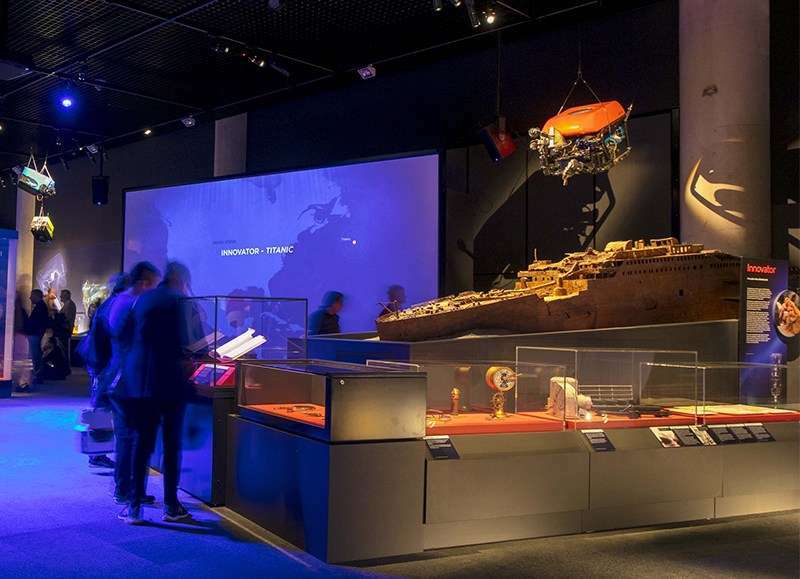 The detailed 5-metre long scale replica model of the wreck is on display, along with the ROV Snoop Dog, as part of the exhibition. Image: Andrew Frolows/ANMM. Exploration is curiosity acted upon. It should be accessible to everyone. What is the difference between an adventurer and an explorer? One does it for the ego and glory, the other to gain and share new knowledge. Encouraging underwater exploration in the next generation is another aspect of Cameron’s passion for science and storytelling. He is a patron of National Geographic’s OpenROV program, which has supplied a thousand remote operated vehicles (ROVs) to schools, allowing students to explore their own marine environments. The satisfaction of going, and seeing, and learning, working with the scientists to shed more light on a problem… There’s nothing more satisfying than that. In 2003-2005 Cameron assembled a team of young American scientists to join his expeditions to study extreme underwater environments and ecosystems in the deep oceans and around hydrothermal (volcanic) vents in the Atlantic and Pacific Oceans. The life that thrives around these vents in total darkness and superheated, toxic water could inform theories of how life might exist beyond Earth. Today Kevin Hand, a young astrobiologist and planetary scientist on the expedition, is a Deputy Project Scientist for the Europa mission of NASA’s Jet Propulsion Laboratory. The mission’s ‘Europa Clipper’ spacecraft is scheduled to do a flyover of the ice crust of Jupiter’s moon Europa in the next decade. Scientists theorise that if deep water-filled oceans lie beneath Europa’s frozen crust they might contain life. This is my church, down here… nature’s imagination is greater than my own. 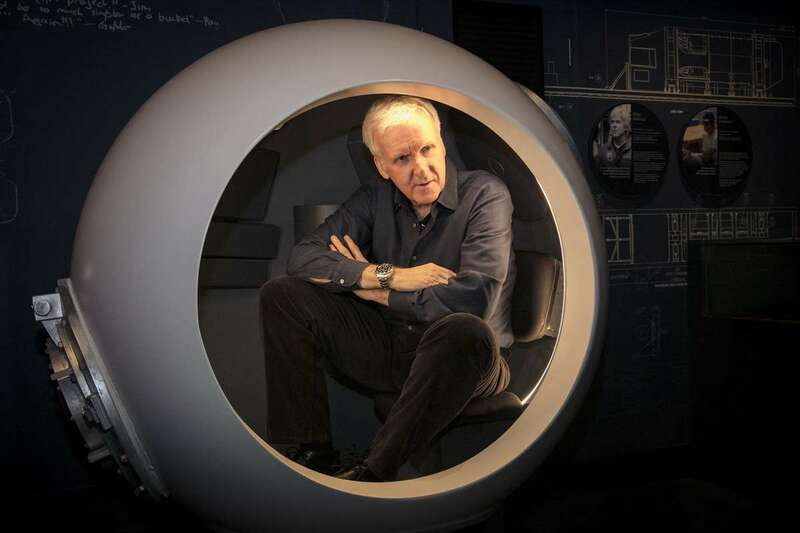 – James Cameron, posing in a prop of the pilot sphere for DEEPSEA CHALLENGER, on display as part of the James Cameron – Challenging the Deep exhibition. Image: Andrew Frolows/ANMM. Bonus: We save the oceans on the land first. This is my church, down here… nature’s imagination is greater than my own. Exploring our oceans is integral to understanding humanity’s place within the ecosystem of earth. Sustainability and limited resources are growing issues. Our consumer patterns, impact on the environment and the long-term outlook for the planet is a closed system. Saving the oceans won’t be successful if we just focus on one part of the puzzle. Likewise, the health of our oceans feeds back into our understanding of climate patterns, forecasting capabilities, food production and so on down the consumer chain until you have the dinner on your plate. James Cameron – Challenging the Deep, is on now.